This week I received notification that British aromatics creators Czech & Speake are set to re-release a trio of sophisticated and beautifully presented scents in their Prestige Floral Collection of fine fragrances. The line up celebrates the return of three classic Czech & Speake scents: the vibrant and youthful Rose (1988), the sensual floral Mimosa (1986) and the exotic 2003 launch: Dark Rose. I have been hoping to try Dark Rose for a number of years now, but with its deletion from the C&S portfolio several years ago, it made it almost impossible to source. At last my opportunity finally arose this morning when I received a very generous C&S sampler from London, comprising each scent from their aromatics line. Dark Rose is a tenacious blend that excites from the get-go. The opening is sprinkled with fragrant saffron before the strikingly rich rose, precious woods, synthetic oudh and white musks combine to create a perfume that is unmistakably Indo-Arabian in nature. 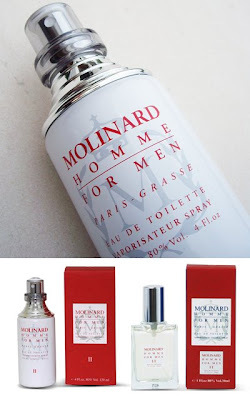 It is not unlike every existing Montale aoud/rose release in both its style and composition. To a Western nose that has had little exposure to middle-eastern inspired perfumery, Dark Rose will excite and bewitch; but for those familiar with Montale's aouds and true Arabian mukhallat oils, it may fail to impress. In August last year I blogged about Mukhallat El Emirates - a robust and opulent elixir that now to my nose, I regard as the absolute kissing cousin to Dark Rose. Comparing the two back to back, I am almost unable to determine any differences in smell... any variation that does exist, I would likely attribute to the quality of materials used in each composition. The mukhallat contains natural oils and extracts, whereas the C&S release is comprised of a long list of copy-cat synthetics (many of which are clearly declared on the back of the sample card). Dark Rose's persistence and sillage are fleeting (perhaps 2 or 3 hours, tops), whereas a few drops of the Arabian oil will imbue the air around you for the better part of an entire day. 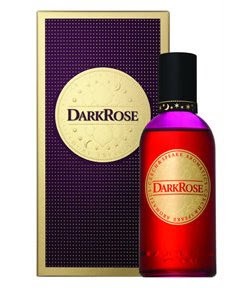 I would be very interested to obtain a sample of the original 2003 Dark Rose cologne, just to determine if there are any nuances (both subtle or obvious) that differ from the reissued formulation. I might say that Dark Rose 2009 does manage to cut a path amongst many banal mainstream and niche releases, and its interpretation of Indo-Arabian perfume is sound; however when given the opportunity to measure it against the real thing, Dark Rose falls just a little short. In 2007 I stumbled across a compelling image of a £50 million diamond-encrusted skull exhibited by English artist, Damien Hirst. This profound artistic statement in celebration against death instantly reminded of ornamental El Dia de los Muerto skull depictions prevalent in Mexico; as well as rich pirate iconography common in Caribbean cultures. At the time, I was wowed by the way Hirst had transformed a human skull into an extravagant objet d'art. I'd long since filed this image away in the repository of my mind, however it skipped into my consciousness again just a few weeks ago, when a friend introduced me to a fragrance from the By Kilian perfume portfolio. The scent in question: Straight to Heaven: white crystal. Straight to Heaven, is a scent inspired by Martinican Rum - the alcoholic life-blood of the Caribbean islands. Its opening is dark and fruity - thick with the semi-sweet aroma of fermenting sugarcane and dark molasses, distilled and stored in old wooden barrels. With it, there is a sense of a warmth... like the radiating sting of an aged rum as it slips down the oesophagus. Several accords drop anchor at the heart of this fragrance - most notably, cedar and Indonesian patchouli: each of which contribute a dense earthiness to the mix. But it is over a swelling tide of white musk that this composition stays afloat... the musk is sharp, crystal clear and well-refined. When experiencing the total sum of these accords, one can easily visualise the ghosts of marauding buccaneers patrolling the Spanish- American coastline with the jolly roger hoisted high above their heads. It is a scent that is nostalgic and in the here-and-now. 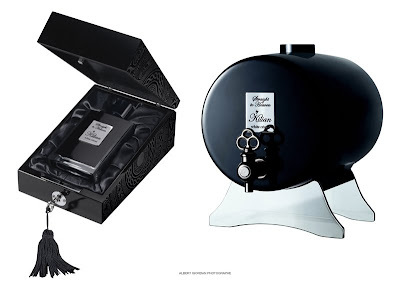 It is a fragrance that is commanding and masculine, but also one executed with enormous care and delicacy. The brand itself is the culmination of French cognac heir and perfume marketer/developer Kilian Hennessey's efforts, and furnishes men and women with exquisite fragrances of unrivalled elegance and uncompromising luxury. This is clearly evident in the quality of the materials used, and the treasure chest-like presentation of the flacon in a satin-lined box with a lock and key closure. I am also very taken with the 1 litre barrel-shaped fountain, that allows you to refill your bottle at home. Such treasures I would also regard as objets d'art, and feel they would certainly take pride of place in any self-respecting pirate's plunder!